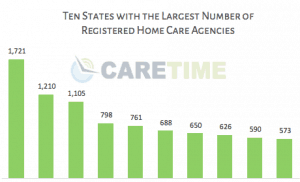 The U.S. has over 15,000 registered non-medical home care agencies. The services provided by home care agencies may include personal care services such as hands-on assistance with activities of daily living (ADLs), e.g., eating, bathing, dressing, and bladder and bowel requirements; homemaker services and instrumental activities of daily living (IADLs), e.g., taking medications, shopping for groceries, laundry, housekeeping, and companionship; and/or supervision or cuing so that a person can perform tasks themselves. 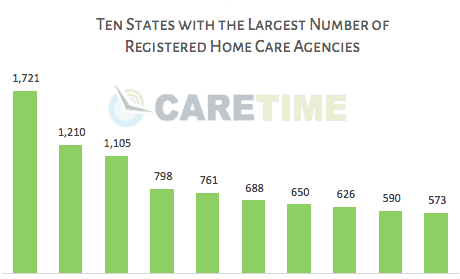 CareTime has compiled a list of the top ten states with the most home care agencies. The top ten states account for 56% of all the agencies in the country. The number one state accounts for 11% of the agencies in existence. 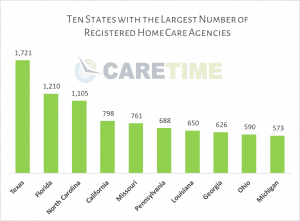 Without further ado here are the top ten states for the most home care agencies. Texas clearly is on top with over 1,700 home care agencies and roughly 11% of all US home care establishments. The three states of Texas, Florida and North Carolina make up 26% of the country’s home care companies. Looking for help growing or managing your home care company? CareTime provides home care software and helps you manage, grow, verify visits, schedule care, document visits, and keep track of clients and caregivers.